At our wedding we served a raw foods wedding cake. We didn't publicize this; in fact, if you weren't told the cake hadn't been baked, you wouldn't know. Why am I bringing up our wedding cake? Because raw foods relate to a cookbook by Adelle Davis that I'm currently reading. 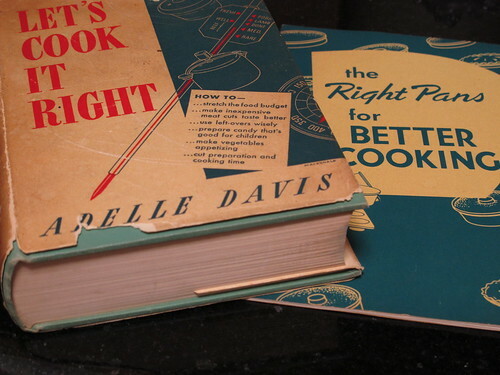 Adelle Davis, according to Wikipedia, was a pioneer in nutrition and advocated whole unprocessed foods. Her beliefs were radical for their time and have since been proven to be "largely right" by medical research. "If nutrition is to be successfully applied, the homemaker must be able to prepare delicious foods which appeal to the eyes and nostrils as well as to the taste buds. It is a popular belief that anything which builds health tastes like witches' brew and looks like baby spinach. Exactly the reverse; foods which retain their greatest nutritive value also have the best flavor, texture, and color." See the connection to our raw foods wedding cake? Delicious, nutritious food that appealed to the eyes and nostrils as well as the taste buds. Credits: Image taken by Eden Hensley Silverstein for Recipes for the Good Life.